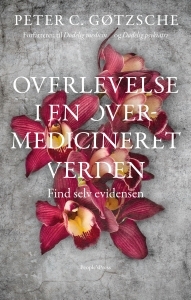 Profess or Peter C Gøtzsche’s book Deadly Medicines and Organised Crime from 2013 won first prize in the “Basis of Medicine” category of the British Medical Association’s annual book awards in 2014. Prescription drugs are the third leading cause of death after heart disease and cancer. 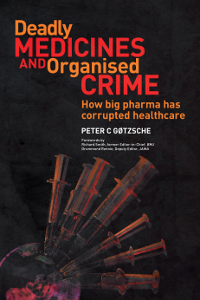 In his ground-breaking book, Peter C Gøtzsche exposes the pharmaceutical industries and their charade of fraudulent behaviour, both in research and marketing where the morally repugnant disregard for human lives is the norm. He convincingly draws close comparisons with the tobacco conglomerates, revealing the extraordinary truth behind efforts to confuse and distract the public and their politicians. The book addresses, in evidence-based detail, an extraordinary system failure caused by widespread crime, corruption, bribery and impotent drug regulation in need of radical reforms. 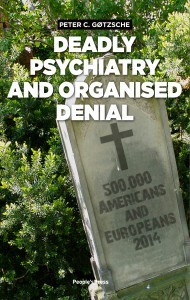 The behaviour of Big Pharma fulfils the criteria for organised crime in US law. 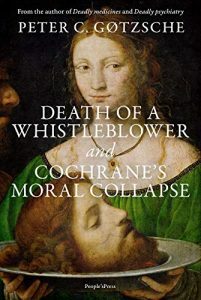 Gøtzsche exposes in his book the pharmaceutical industries and their charade of fraudulent behavior, both in research and marketing where the morally repugnant disregard for human lives is the norm. In this way, there is little difference to the tobacco conglomerates, which also succeeded to confuse and distract the public and their politicians for decades. The book addresses, in evidence-based detail with more than 900 references, an extraordinary system failure caused by widespread crime, corruption, bribery and impotent drug regulation in need of radical reforms. Gøtzsche suggest a number of such reforms and also what the patients can do under the current system to protect themselves against ineffective and lethal drugs.